Sarah started riding at 9-years old and began her dressage training at the age of 10, with Canadian Olympian Leslie Reid. She rode her first Prix St-George at just 14-years old and went on to win Championships and Reserve Champions at Young Riders and Prix St-George level. 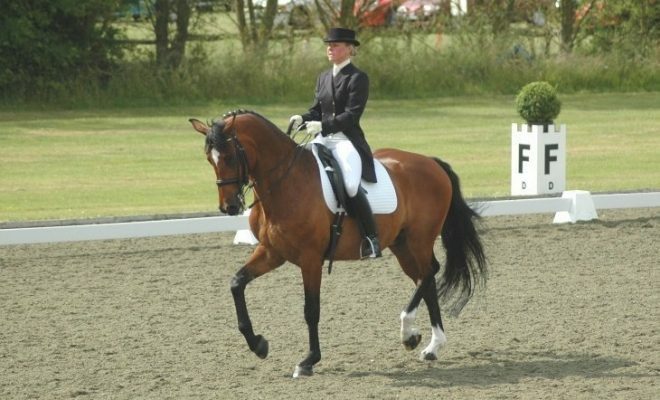 Sarah moved to the UK in 2007, where she met her husband and later opened up her own training and livery yard in 2008. 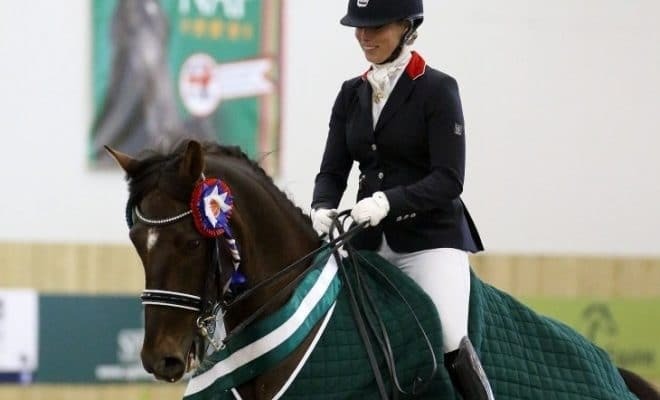 Between 2011 and 2012, Sarah had various placings at Grand Prix, before heading off for a maternity break, but she’s now back in the saddle with various placings at Prix St- George and Intermediate I. Really excited to have you here today Sarah, so welcome to the podcast. Thank you very much, happy to be here. To kick this off, as a bit of an ice-breaker, we’d like to know something interesting about you, that most other people wouldn’t know. It doesn’t have to be horsey related, just a bit of an interesting or weird fact about yourself. Well, I was born in Canada, but both of my parents are Swedish speaking Finns. English is actually my second language. Well I did learn English at kind of three or four, so I’m hoping it doesn’t show, and my Swedish, on the other hand, is probably not so strong. You have been living in the UK for quite a while now, so I’m guessing you have more practice at English than you do at Swedish at the moment? Yes, definitely. I think consistently there’s a short, short period of time where I lived in Oslo and got to actually use it, but for the most part, it’s English strong. Give us a little bit of an insight into your personal life; where you’re based at the moment, we said in the intro that you are married, have got any children and what is a typical day for you like? Oh, I mean it really depends on the day now. I’m married, based in Horsham in the South East of England and I live here with my 2-and-a-half-year-old daughter. I’m now kind of part-time really. It depends on if I’m on a work day, when my daughter is in nursery, or if I’m on a mummy day – in which case I only get the horses that I have in training done and then spend the rest of the time being bossed around by a person that’s about the same height as my knees really. You wouldn’t have it any other way though would you? The bossing around, sometimes it would be quite nice if she would just do as she’s told. I don’t have any children, so I can just laugh and find this all amusing, but I may have to go through this at some point in my life. Hey, I think they’re priceless and especially when it’s your own, but there are definitely times when I think it was much easier to put really, really long days in at the stable yard. I’ve got one of my own and then I’ve got four that I do really regularly, and then I occasionally pop on client’s horses when they’re either being naughty or they need to learn something new. Okay. Okay, naughty horses, are you the naughty rider? Preferably not, but it seems to be the way it happens though. When they’re occasionally just saying “No I’m really not going to do that shoulder-in” or “I’m really not going to do something” and the easiest way to figure it why is to have a hop onboard and see if they’ve just had a miscommunication issue, which it usually is to be fair, or if they actually might have a problem going on. 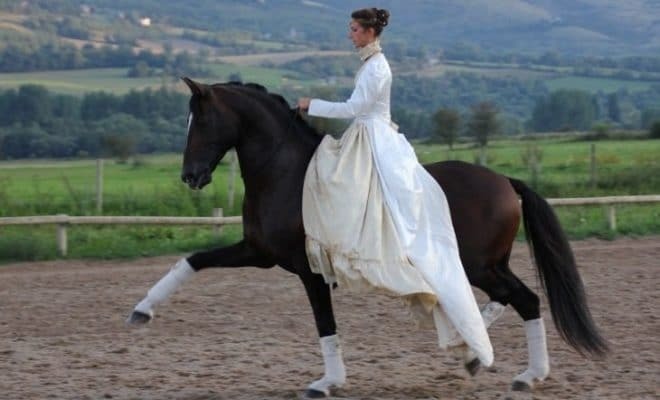 Give us a little bit of a history into your dressage career. At the start of the interview, I said that you were riding from aged 9 and you had a fantastic instructor from the age of 10. Give us a little bit of a sum up through your dressage career so far. What were your massive highs, are any competitions that you particularly felt good about? When did you get to Grand Prix? What sacrifices have you had to make to get there? It’s a very long question this one. It’s a very long question, probably has a very long answer, so please do cut me short if I run on a little bit. I think really there isn’t a specific competition that’s been a particular highlight, I’m on the lower side of the number of outings really. I’ve spent more time focussing on training and working for people and that has probably been my biggest high. After having a great start with Leslie Reid, and then having several horses through young riders, I ended up with a couple of years break due to an injury and disappointments. 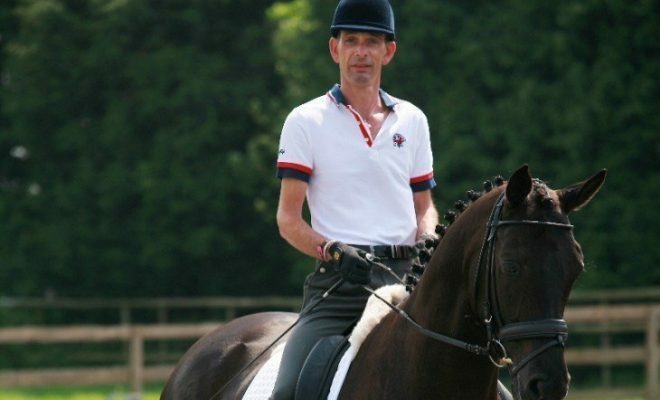 I discovered that I couldn’t possibly do without riding and decided that the level of education I had would not be able to fund my superstar dressage career, so I would try and do it professionally. I went over and worked as a working student for Leonie Bramall and then she later employed me the next year to come back and work as her Head Rider, which was interesting seeing both sides of the same stable yard, even though you’re doing really roughly the same job. From there I had a couple of opportunities to travel and work in different countries. I worked in Australia for a little while, in the Queensland area, giving lessons in riding and partying a bit too much. I worked in Northern California, for a little while and went to watch the World Cup in Las Vegas and decided that I was still nowhere near good enough so headed back to Germany. I was fortunate enough to land myself a job with Klaus Balkenhol, which is probably one of the places where I found the greatest inspiration. At the time he was the American Olympic team coach and so all the riders came over in preparation for the Aachen World Equestrian Games. I got to see from the inside what it takes to prepare these horses and riders and all the team that come along with it, to get to the highest level of the sport. Also, Klaus is a phenomenal trainer himself, done some great work since then with Laura Bechtolsheimer (now Tomlinson), and just well, I think the list is too long. He’s better Googled if you don’t know him. From there I ended up in Switzerland as Klaus was downsizing his yard, a Swiss rider offered me to keep her advanced horses fit, and from there I got poached by Desi Dillingham, who said I must, must, must come to the UK. She found me a job over here that didn’t suit me very well, but I found my husband and have stayed in the UK ever since. In terms of ways up to Grand Prix, I only really got to compete Grand Prix in 2011, that was my first time that I got there, even though I’d trained a bunch of horses almost to that level or had been riding horses that were at that level, I was never given the competition ride on them. Yes, 2011 was a big year for me, and also the introduction to the shock that when you get to Grand Prix, you’re not even there yet really. There’s a lot more to learn. Yes, it’s been a long road really. How did that feel when you first did your entry, the centre line at the end and saluted the judges in your first Grand Prix? How did that feel to know that you were competing at the highest level? Do you know I think I was in such a haze of nervous excitement, worry, all sorts of things that I don’t actually remember much from that first centre line. Do you remember how the test went? I’m guessing anybody who rides their first Grand Prix test would like to have a nice score, but you’re not thinking about it as much, you just want to get through that test. Do you remember how you did at all? The mare had already done Grand Prix before, but it had been three years ago, so I was bringing her back into condition and thought it was probably better to go out a bit earlier rather than a bit later, so I think we ended up with 58 or 59 percent and lots of mistakes in there. It was a very positive experience, and at the same time, it definitely showed me that what you can do at home is not necessarily what you can do in a competition arena. I was speaking to a judge the other day and she said the exact same thing. She said she got to Grand Prix and when she was driving back home in the horsebox she thought to herself “I’ve still got so much to learn.” She felt like she had just started again. Absolutely. I mean I think Stephen Clarke said it the best to me, because I had a session with him, where I’ve been fortunate enough to work with him a few times a year, probably for the past 7 years really, and he said to me after I had come back and done it, “Ah, and now the real learning begins.” I think he couldn’t have said it better really. Throughout your career you’ve ridden many dressage tests, what’s the worst thing that’s ever happened to you in a test, at any level? Is there anything that particularly stands out in your mind? The absolute biggest horror has probably got to be my first International Grand Prix, of course, if it’s going to happen it’s going to happen at the big one. First International Grand Prix, attempting to qualify for the Canadian Olympic team, and the mare I was riding had a few bad, historical incidents, so she was quite nappy going back to the stable. I didn’t have my normal groom with me, my husband was grooming for me that day, and I hadn’t clarified well enough, so just as the rider before me was finishing her test, I realised it was her, I’d had him rip off the bandages and I had to then canter back to the competition arena which was the direction of the stable yard she was trying to nap to, so I had bucking in the test, I had resistance, I had all sorts of things that could have been easily avoided if I’d planned better and communicated better with the person that was looking after me. I learnt a big lesson that day about being very clear to everyone around you, in advance, what the expectations of them are. But again it was my job to make sure that they knew that my groom always told me “the horse before you’s going in, do you want me to take the bandages off?”, not to just assume that it would continue to happen. Yes. It is true though, it does always happen in the worst place. It’s always at the big shows, or the one that means the most, or the one that you’ve been practicing for really, really hard and it’s nice to know that it happens as well to Grand Prix riders. It does make us feel a little bit better, although it probably wasn’t the most pleasant experience for yourself. Well, I think it’s just a bit more gloriously spectacular when it goes wrong at Grand Prix isn’t it really? Yes. I think it was something else for the judges to look at, probably wake them up a little bit, didn’t it? What has been your biggest temporary setback throughout your career? Obviously, you’ve had to look at funding your competition career, but have you had any injuries at the wrong time or personal injuries to yourself? For any setbacks that you have had, how did you get over them and move on and continue with your career? I think there’s a ton of them and I think probably the one that’s the most recent and most challenging one has actually been pregnancy and the birth of my daughter. As previously I’ve just dug in and worked longer and harder if there’s been anything that’s come wrong, and things have come right from that. Now I’ve got somebody else that I have to think about, I can’t just go straight and go “Okay, well I’m just going to stay out at the yard” or “I’ll go to the gym afterwards” or “I’ll have to this…” everything has to be carefully planned and certainly at the very beginning I tried to do way, way, way too much when she was young, and actually the quality of what you’re doing decreases then. So, it’s taught me valuable lessons about scheduling, prioritising and finding balance. I think now, two years down the road, it’s left me a better trainer, coach, athlete, all sorts of things. But it was pretty rocky, especially that first year. Yes. I can imagine. Trying to adapt your whole life to this small human being that’s going to be coming along soon. And obviously, once you get later on in your pregnancy, you are unable to ride, unable to train, and unable to do the normal jobs that you would be able to do on a day to day basis. Yes, I was pretty lucky, I was running my own yard and I did close it. I had a feeling that it was going to go that way and I was fortunate that I did close it because at five-and-a-half months pregnant I was waddling around doing turn out, mucking out stables and riding four horses, thinking “This cannot continue, I can’t keep this up.” That was just on the last week of closing it, and definitely, at seven-and-a-bit months I was no longer able to ride anything and really had to back off most of them before that. I mean ultimately it’s a short period of time out of the saddle, it’s frustrating, but you can keep doing the work on the ground side, having help doing Pregnancy Pilates and stuff, trying to maintain as much fitness and strength as I could. I think there are ways around most things, particularly when it’s a temporary setback. We’re so lucky with this sport, we have time. What was it the oldest competitor at 2012 was in his 70s? Yes. I think with dressage it’s almost something that you do need the time for. You hear about loads of other success stories, maybe not so much in other sports but in other walks of life, for example if you think of success in business; there are people that will start up in business and six months later be a millionaire, but you will never find it in dressage, that someone just sits on a horse and the next thing you know they’re riding at Grand Prix. It takes such time and commitment and no matter how much money you’ve got the bank, you can buy that Grand Prix horse and the expensive horsebox and all the things that we would love, but that doesn’t make you a Grand Prix rider. It is something that has got to be worked on and you have got to put in the time and the effort, the sweat, the blood and the tears to actually get there. I think there’s definite truth in that and I think on the other side of things, there’s huge value in the journey. I mean yes absolutely it’s fantastic to ride Grand Prix, but it’s also fantastic to ride your horse’s first shoulder-in. 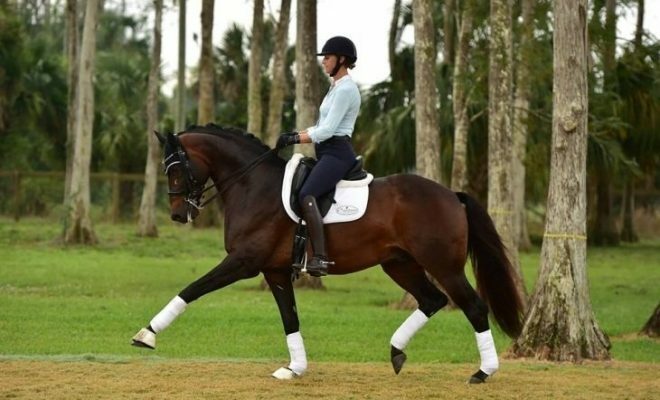 Or it’s fantastic to do your first canter schooling pirouette and have that turn into a pirouette, or more simply it’s fantastic to do a 20-meter circle where finally he stays in a nice balanced rhythm. Every goal should be a satisfaction and if it’s working along those type of lines, I think it’s just a natural progression thing and the time doesn’t seem so difficult then. I think that was really, really nice what you said – it’s celebrating them little successes along the way. And it is that saying, that it’s not the view from the top, it’s the climb that it takes to get there. Absolutely and it’s also, realistically, you’ve got to climb a whole bunch of mountains to do it. It’s not just one of them and everybody’s mountains are going to be a little bit different. I think one of my favourite sayings I’ve ever heard has been that “you can drive all the way across a continent, just going on the distance that you can see in your headlights, in the dark”. Really, I’ve said that terribly bad, but it is actually a beautiful saying. I know what you mean, so I’m hoping everybody else… I know what you mean. You’re going all that distance, but you can only ever see that little bit in front of you, it’s just getting through that next step. That’s it. Much better said. I don’t know if I did a very good job of that either, but I’m hoping everybody listening will get what we mean! We know what we mean. 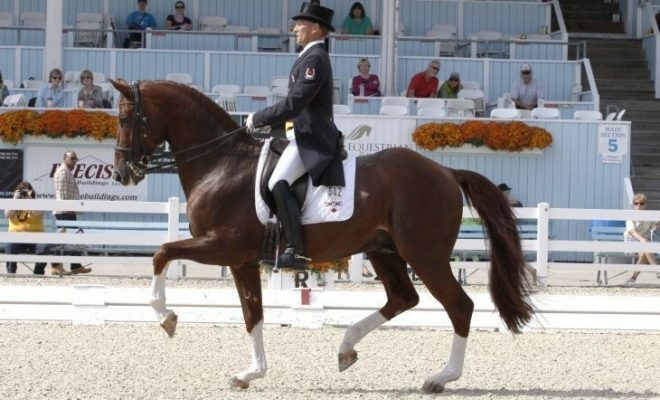 I think a big problem that riders face, is taking the step from dressage being a hobby and making it their profession. There are so many people who want to do it as a profession on a full-time basis. I’m not sure if you did any other, like I would say, ‘normal’ jobs, before you went into dressage because you were trained at such a young age, I’m not sure, did you go straight into the dressage profession? No, I didn’t. I had a couple of years off, I did some school, I did work in IT support of all things! Yes, so I had the normal life and normal existence. At 24, I went and became a working student for the first time, so much as I had the advantage of going into the working student position, with significantly further training than a lot of people do, I had the advantage of being a little bit older, a little bit wiser to it. I think if you’re looking to go in and become a professional, the best thing you can do is find yourself a good- and it doesn’t have to be a top-level professional- but a good professional, that’s someone you’d like to emulate and see if you can work for them. Either just on a part-time basis or a bit of a basis, so you can get your feet wet and actually see whether or not it suits you. It’s a fantastic job but it’s a hard one, both physically, financially, it’s very difficult. There’s a whole bunch of ups and downs to it and to see if it’s a fit for you, the best thing to do is to try and do it and even if you’re not getting to ride the horses, just seeing how their stables are run, what’s involved in that, how long the day goes. The more you can follow somebody around that’s doing what you are assuming that you want to do, the better idea you’ll have and the more knowledge you’ll have when you actually want to start your own business. What top training tip would you give? If there are people at home now, that they’ve got their horses, they’re training, they’ve got dreams to get to Grand Prix, what would be your top training tip for these people listening? As they’re working their horses at home, what would you say for them to keep in the back of their head? Or the most important thing to work on with their horse? or the most important goal? Anything that you can think of that will just help them get to that dream of Grand Prix. I think ultimately Grand Prix is just building on the very basics of horse riding. Essentially your goal each time you’re riding should be to have as much control of various different portions. Can you go the tempo you want to go? Can you slow down? Can you speed up? Can you bend left and right equally? All of those ones are what it’s all made of. The tricks of Grand Prix are exactly that and are much easier to teach your horse and yourself if you’ve got a fundamental idea and ability to regulate how your horse is travelling, and that is the tricky part that everybody needs to go back to. The other thing is to try and make it fun; it can get really boring for both horse and rider to go around in circles all the time, so you can do your workout in a field; you can go other places; go for a hack; you know, mix it up a little bit. Fantastic and I think that does help. I’ve had a horse in the past and I’m going to confess a little bit, I much prefer show jumping. I enjoy jumping as a rider, and I remember when I was starting to do dressage that there were times when I found it quite monotonous. I look back now and it was because I was stuck around the edge of the arena, just trotting around, with no real goal or anything. It’s finding ways of giving yourself little challenges or little things to do for both you and your horse as you’re going around the outside. If you find yourself stuck in that one, try and go a little bit quicker strides, or shorter strides between the markers, just mixing it up a little bit. It makes it all easy. It’s so much easier to put your foot in the stirrup, on a rainy horrible day, if you’re going to do something that you are both looking forward to, than if you’re just going to go round the outside of the arena. Yes. I think, also, when you’re riding so many horses, sometimes it becomes just exercising them for the sake of exercising, and that’s when it can get a bit monotonous. You’ve just got to get this horse out for the sake of getting it out, and that can take all the fun out of it and it makes it a chore. I think there’s also a good point on that one, to know what your own best number is. I know 6 horses I can do with concentration and focus and any more than that, then it does become a little bit of a ‘getting them done’ type of a thing. And each person has a different number, but yes, my days of riding 10 in Germany are definitely over. Oh 10, that was a long day, wasn’t it? There were 12 stables to muck out beforehand. Yes. They work you. I hope you got paid well. I know it was a silly question wasn’t it? That is a very silly question. I did get to dig some ditches though. Oh dear, right. 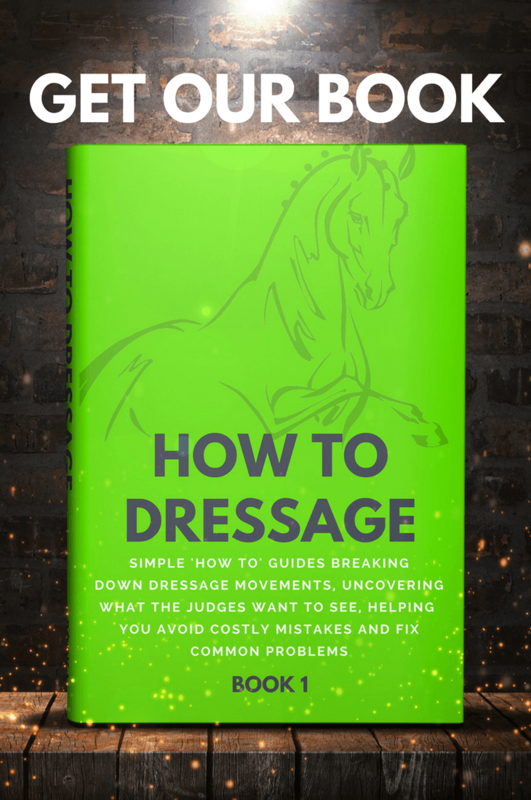 What would be the single piece of advice to aspiring dressage riders? We had a look at the training advice, what would you say to the rider that is maybe not going through the easiest time at the moment? Maybe their horse has been injured, or maybe things have gone a little bit wrong when they’ve introduced a new movement and they’ve had to go back a couple of steps to rebuild, and maybe they’re feeling a bit defeated inside. 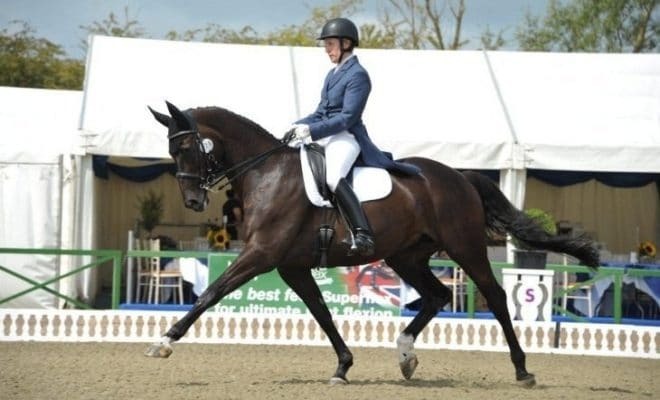 What advice would you give to inspire them to keep going with their dressage career? I think the biggest thing that separates I think the great riders from those who just ride and might ride well, is the number of problems that they have had to go through. Problems are part of it. You learn from them. If things are only going well, you only know how to deal with it when it’s going well. I think the advice I’d have is; each and every situation that happens, try and break it down, think about what you can learn from it and take forward and know that that makes you a stronger and better rider in the end. Take it as a positive, it’s not a negative. This is a positive experience for you to go through and it’s just adding another feather to your cap. Yes, even if it’s not a positive one, it’s a learning one, and the learning is the critical portion of getting where you want to go. Even if it’s learning that ‘I never, ever want to do that again’, then at least you know that the next time that opportunity comes up, know I’m just going to say “No thank you.” Or that way of training isn’t one that suits me and my ethics, or that way of schooling, or taking the horse out onto that type of ground resulted in an injury, that was a bad idea so that you won’t make the same mistake again. Yes. It’s all about the learning curve. It’s not a setback it’s an opportunity for a lesson. I’ve had a really, really good time interviewing you today Sarah, and I’m sure everybody listening has got loads of great tips, as well as finding out a little bit more about you and about what it takes to become a Grand Prix rider! What is the best way for people to connect with you? If they want to follow you on Facebook or Twitter, do you have a website or anything? I have both a website, Facebook and Twitter, I’m still pretty much a Twitter novice, so, by all means, Tweet me and chase me up if I haven’t done it properly, whereas Facebook I’m a bit more experienced at. My website has my email address on as well, and phone number, anyway, just get in touch, I’m very happy to try and help. So you can get in touch with Sarah if you have any training issues or if you just want to follow her dressage career – because I think you’ve still only just begun haven’t you Sarah? You’re still going. Long way to go hopefully. Thank you very much for your time today and I’ve had a really good time interviewing you. I hope you have a successful season. Thank you very much; it’s been an absolute pleasure.